In the cutthroat world of being a solid, medium-sized band, it can be difficult to get noticed. No one watches music videos anymore—who’s got the time? !—and there are a dozen track premieres and album streams to choose from every single day. In the grand tradition of Journey: Escape and Iron Maiden: Ed Hunter, two bands have released their own video games in the past couple of weeks. Just today, Mac DeMarco loaned his face and cigarettes to Mac DeMarco Squish ’Em, in which you choose a brand of cigarettes, then try to kill bugs with them for about 15 seconds. 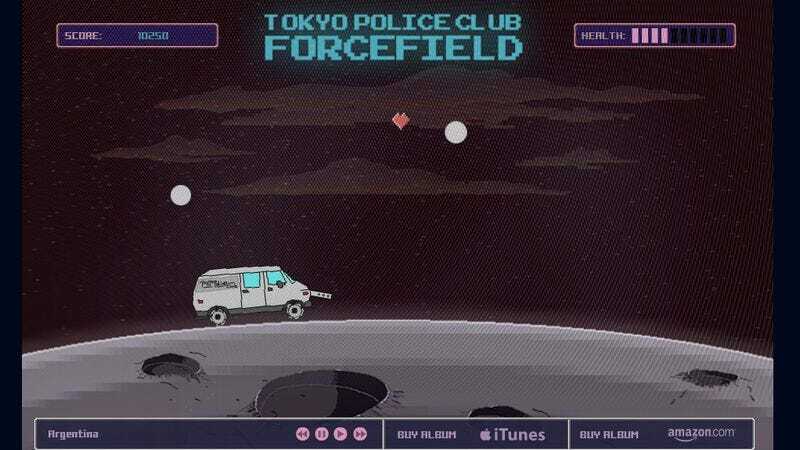 This comes hot on the heels of the slightly more complicated Forcefield, which is a very short Moon Patrol ripoff put forth by Tokyo Police Club to promote its quite good recent album of the same name. If you’ve got half a minute to spare, you can make it through to the exciting conclusion of either.